Heat gas or charcoal grill. Between pieces of plastic wrap or waxed paper, place each chicken breast smooth side down; gently pound with flat side of meat mallet or rolling pin until 1/2 inch thick. 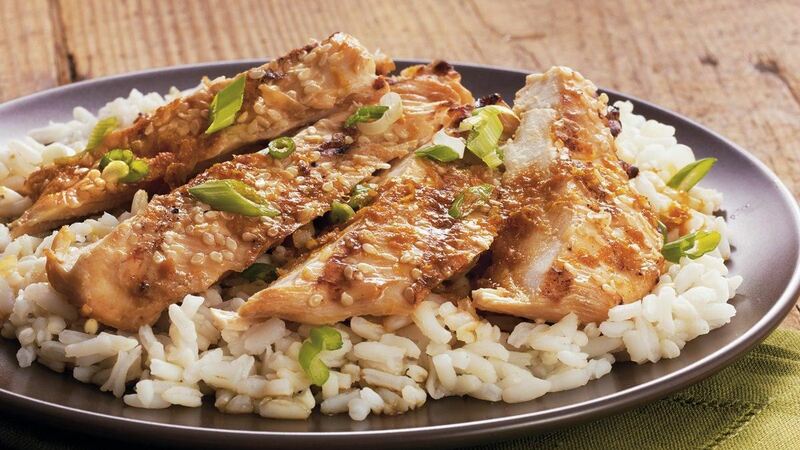 In small bowl, stir orange peel into teriyaki glaze. Reserve 2 tablespoons glaze mixture for serving. Brush both sides of chicken with remaining glaze mixture. Sprinkle sesame seed over both sides of chicken; cover chicken with piece of waxed paper and lightly press seed into chicken. Place chicken on grill over medium heat. Cover grill; cook 6 to 8 minutes, turning once, until chicken is no longer pink in center. Remove chicken from grill to serving plate. Spoon reserved 2 tablespoons glaze over chicken. Sprinkle with onions.